We’re lucky here in the old U.S. of A. App stores are pretty much monolithic and aside from a few odd stragglers, there’s really only one place to find apps for each of the platforms. However, what if your country does’t support a certain app store or what if you want to send your friends to a certain app, knowing that they each have different phones? That’s where Appitalism comes in. 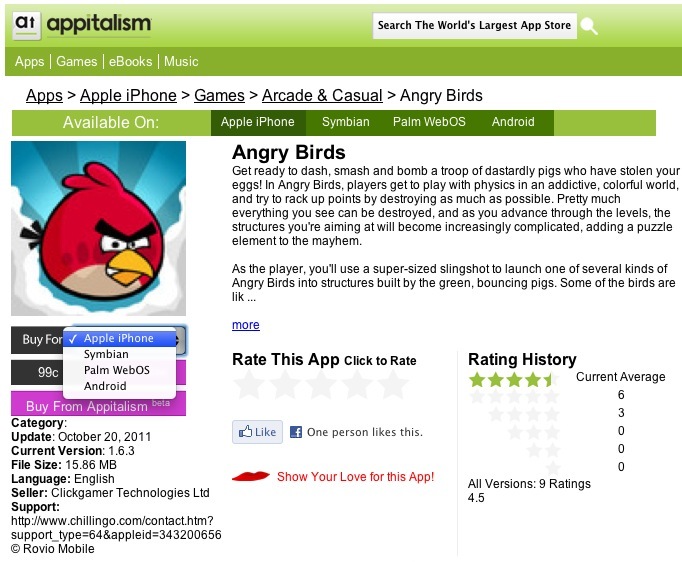 Created by Simon Buckingham, the founder of ringtones.com, Appitalism is a one-stop shop for apps. The system allows you to buy apps for every major platform in one place. For example, you can buy Angry Birds for almost any phone, including Symbian, WebOS, and Android. The system seamlessly submits your order to the official app store in question and, when applicable, supplies a file for side-loading. The service also offers discounts for new users, including 50 cents just for signing up and a few dollars for connecting your Facebook and Twitter streams, effectively allowing you to grab a few free apps just for logging in. While this may seem fairly useless in a sophisticated market, it is definitely helpful for developers and marketers. For example, the service offers a link shortener that takes you to a single page for your app, allowing users to pick up the ported app of their choice while reducing the number of links they have to scroll through to find the right app. Appitalism is also the default app store for many countries and their Wings program allows developers to select where their apps will appear, including in the stores of carriers around the world. In countries like China where there are 70 or so different app stores, this definitely helps reduce clutter. The service is now available in over 50 countries and it works with almost any phone. There is also a Facebook “app” that recreates much of the regular site’s functionality but allows you to share favorite apps with your friends. The company is a subsidiary of Mobile Streams, a digital content retailer.